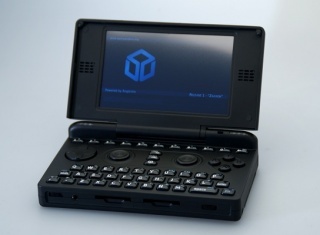 The Pandora is a unique combination of gaming console and pocket computer. The Pandora project has been a group effort from the beginning. 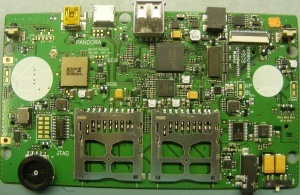 The hardware development team designed Pandora based on specifications requested by its future users. The main physical features - qwerty keyboard, dual analog nubs, clamshell design, pocketable size - were most prominently voiced by the community. The physical appearance of Pandora is an utilitarian result of getting all the necessary hardware into a pocket sized device. Form follows function, and ergonomic is one of the tall orders made. Before the final design came to be, the testing and funding was also done in a community manner. There is no other device that has dedicated gaming controls, two analog nubs and a QWERTY keyboard. It was developed as a gaming device not just to run games made just for it but also to emulate older systems and everyday computing. The Pandora can do all of this because it is a tiny computer running a custom distribution of Linux based on The Ångström Distribution. Because it runs Linux|GNU, the Pandora isn't just a console but a complete desktop computer with access to tens of thousands of Linux programs. Visit the Pandora website for ordering information. 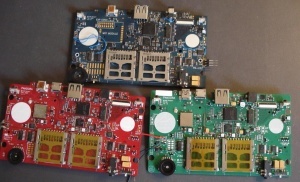 There are three versions, CC, GC and 1GHZ. Base specs are the same, with the GC having more memory and a newer revision of the PowerVR SGX530 graphics chip. The 1GHZ model has apart from a faster processor with bigger cache, faster main memory, faster graphics memory and faster DSP processor. User replaceable battery. Ease of disassembly. User encouraged replacement of board and screen. Replacement parts available: Battery, Buttons, keymat, case, board, screen, screen cable, stylus. Built to last. Quality parts. Long lifespan with updatability on a platform not built for planned obsolesence. Minimal packaging, small cardboard box which can be recycled. Wood packaging box also available. Ac/Dc adapter optional? Battery recycling program? Research taking place on parts used. Possible release of case design files and board schematics in the future. Hardware documentation has detailed hardware specifications. Viewable in direct sunlight, but it will wash out. TV-out included in hardware, A/V-OUT Port (similar in appearance to a large USB OTG port) has Composite and S-Video outputs and 3.5mm headphone output and microphone input. Some devices need to first go through a powered USB hub. Lithium-ion polymer battery, 4200mAh design capacity. Can charge through an AC adapter or USB. Charging with the AC adapter takes about 4 hours from near-empty. In 2 hours you get to about 80%. The Pandora is held together with 5 screws, all of which are M2 thread. The shorter screws are positioned under the battery. 512MB Pandoras (early 2012) The Pandoras produced in Germany by Global Components. Early 2012 systems shipped with an OS that can only address 256MB of the 512MB RAM. You can check this by typing `free` in a terminal. For these systems, an OS update is needed to see and use the full 512MB. As of May 2012, that OS is available as an optional beta update. Official Hackers Manual (v1.01) from OpenPandora Ltd, includes warnings about damage and warranties (or loss of). Gerbers, Bill of Material and schematics. All files within this ZIP archive are owned by MJW Designs (Michael Weston). They are free to use for non-commercial use. in the archive and on your project page (if you have one). If you plan to use them for any commercial projects, please do contact us. Beagle Board Resources As it uses the same SoC, many BB resources are also relevant for the Pandora. OpenGL ES 2.0, several million polygons per second. Two usb host ports. Bluetooth,two SD slots with SDIO capability, and a serial UART for adding whatever additional widgets you want (such as a USB GPS system). 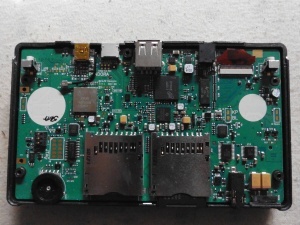 Solder pads were designed into the PCB for "hacking" in extra internal hardware. It is the spiritual successor to other handheld consoles such as the GP32 and GP2X. Have some expertise, or just some spare time? Get involved! This wiki is an unofficial community project. Open Pandora Ltd. is not responsible for its content, and it should therefore not be treated as an official source of information about your device. The information contained in this wiki may be incorrect and/or out-of-date. This page was last edited on 14 November 2017, at 12:17.